Honestly, the cavernous carcass of a building and the furnishings within it–a large furnace, pumps, an ash bin, a big, mostly empty pit, a convoluted series of pipes that run this way and that–isn’t much to write home about. But to hear Gary Powlus talk about it, it’s the thing that’s put his tiny school district on the map. Government officials and fellow superintendents have inquired about it from across the country. It’s safe to say that a good portion of the interest is in the model rather than the biomass heating system itself. Benton Area is a tiny district with three buildings, including this one, accounting for nearly the entirety of its holdings. It serves a rural area (district population, 5,300) and is surrounded by acres and acres of potential supply for its energy needs–39 percent of the district is agricultural land. If all goes according to plan, the $1.98-million system will create something of a supply-and-demand loop. The district will buy the fuel it needs in the form of compressed, dried pellets from the farmers who populate the district. The farmers, finally finding an adequate market in an industry that’s been beset in recent years by depressed prices, will then have the money to pay their school taxes, much of which will eventually cycle back to them after the next harvest. The majority of the process was funded and guided by the Pennsylvania Fuels for Schools & Beyond program. Though actual results won’t be known until the system completes its first heating season this school year, Powlus expects to save perhaps $100,000 annually on its previous oil-burning system. The oil system remains as a backup, while providing flexibility to take advantage of market fluctuations when they occur. However, the entire economic utopia hinges on the farmers’ ability to deliver the goods at prices competitive with other fuel sources. 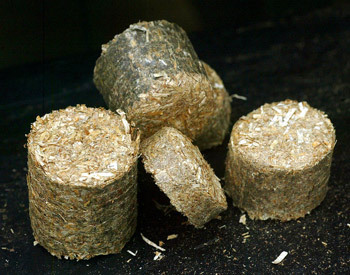 With oil and electricity continually increasing, switching to biomass was logical, a straight cost analysis. 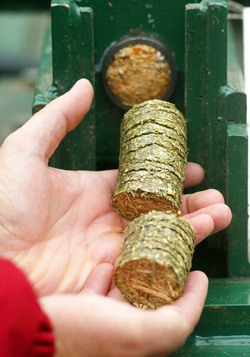 But the potential exists that sources other than the pellets, such as wood chips, could come in cheap enough to entice a school-board vote away from its local base. Enter the mobile pelletizer, a $135,000 collaboration of the Pocono Northeast Resource Conservation & Development Council, the Fuels for Schools program and Buskirk Engineering of Indiana. Situated on a flatbed trailer, the machine is a series of several lesser machines: a round shredder large enough to contain a circular hay bale; a pelletizer that melts the lignin in the shredded material, compresses it all into pellets as small as rabbit food and cools the lignin to reform into the pellets; and a conveyor belt that shakes out excess and deposits the dense material into shippable containers. For $7,000, Buskirk offers a stationary pelletizing unit that runs on a tractor’s power connection. As it turns out, a major impediment to biomass is volume logistics. In its natural forms–everything from native grasses to corn to manure–biomass isn’t compact enough to be economically feasible. It costs too much to transport enough of it, even locally. The pelletizer eliminates that issue, according to Koch, with its ability to create a ton of pellets an hour. Each acre produces more than three tons. The pelletizer’s mobility is an additional asset because it’s far more efficient to move it from farm to farm than to have farmers bring their uncompressed raw materials to a central location. The issue now becomes selling the idea to farmers, who’ve enough to worry about managing their traditional markets for crops like corn and hay. Due in large part to their reliance on an annual harvest with nearly zero margin for experimentation, they tend to shy away from untested methods in favor of tried-and-true markets. Scott Singer, a wildlife biologist with the U.S. Department of Agriculture, estimates there are roughly 4,000 acres of native grasses growing in the county. The RC&D council has contracted with Benton to provide two years of pellets with grasses donated by the state and Ernst Conservation Seeds. For their part, Powlus and district facilities manager Jeff Kelsey are excited about the possibilities. “In my opinion, what sold me is we can save money and help the environment, and I know people in our community feel the same way,” Kelsey says. The whole idea, however, wasn’t an economic slam dunk. It required a degree of financial extension on both sides. In fact, the whole thing came to Benton’s attention only because Koch’s mother, Beverly Ribble, is the district’s business manager. Benton received $700,000 in grants through the Fuels for Schools program, and the council created the pelletizer with similar funding. Additionally, it was designed and built at a loss as a model, hoping the example, excluding the engineering costs, would prove itself enough on a spreadsheet to entice farming communities to commission a copy and avoid the costly design phase. “If you don’t get the grants, is it economically feasible? We’re trying to answer that,” Singer says. The concept is at least potentially viable enough that some startup companies are trying it. 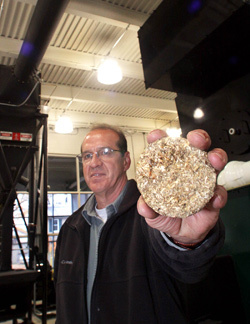 BHS Energy in Luzerne County is a family operation working on a stationary pelletizing system for about $50,000. Leonard Reggie and his sons, Adam and Bryan, hope to market the idea to electricity generators as a cheap, quick transition fuel at coal-fired plants to reduce polluting emissions or at small-scale facilities for community use. The idea would be for municipalities to pelletize the yard and municipal waste they already collect and use it to run perhaps a one-megawatt generator. “It’s going to be huge,” Leonard Reggie says. “Canada’s doing a lot with it, but again, they’re moving slowly on it. They’re waiting for financing. Once the price of oil goes up, everybody panics and starts looking for osmething else. That has a lot to do with it.” . He also envisions the Fuels for Schools programs in various states taking off, thus fueling his pelletizer’s evolution to a system that would rake up the biomass from the ground and process it, like a haybaler. But for now, times are tough. BHS has sold one of its units to a New York farmer who hasn’t rounded up the funding to install the greenhouse boiler for which he bought the pelletizer. For Singer, the whole objective is rural sustainability. As the cost of everything increases, he argues, rural communities need to return to self reliance for everything from commerce to energy needs to environmental stewardship. 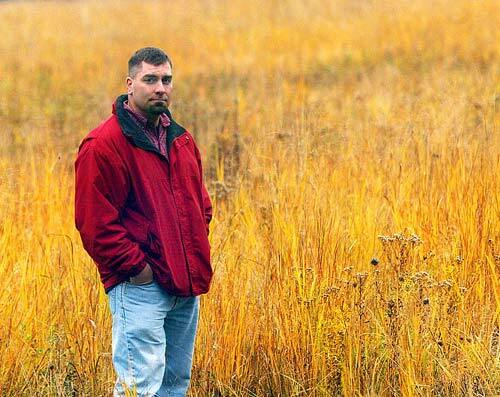 Biomass energy is a great example, he says, because it allows farmers to grow native plants that reduce runoff, lessen fertilizer additions and require less oversight to produce a quality harvest. Use locally means it can keep money cycling in the community and eliminate the financial outflow that impoverishes rural areas and causes emigration from generations-old homesteads, not to mention the sale and development of farmlands that leads to suburban sprawl. “It’s feasible to actually think of this on a full scale for all our fuel-oil needs,” Singer says. 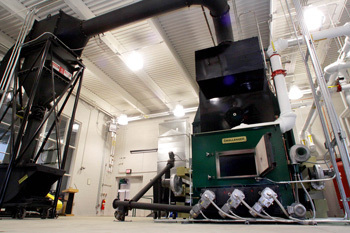 Benton’s isn’t the first industrial biomass heating system, even in Pennsylvania. There are eight such projects, including Clearfield Middle School in Clearfield County and Mountain View School District in Susquehanna County. But none is attempting to marshal its local resources like Benton–all but one is burning wood chips. Dillon Floral Corporation in Bloomsburg heats its building with the refuse from its production. Whether the idea would work in less agriculturally dominant areas remains to be seen, but it holds promise, if for no other reason than the economics currently hampering it are poised to invert.